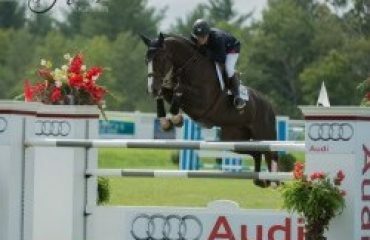 Each year, the United States Pony Club sends a team to the Pony Jumper Championships at Pony Finals held at the Kentucky Horse Park in Lexington. 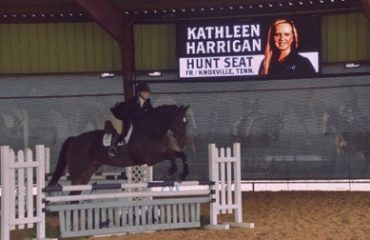 This year, team member Keely Bechtol, a 14-year-old C-2 Traditional member of the Bluegrass Pony Club in the Midsouth Region, attended. Being a C-2 Traditional member means Keely is considered a strong intermediate-level rider and has excellent horse management skills. These skills made Keely an ideal candidate for the team. 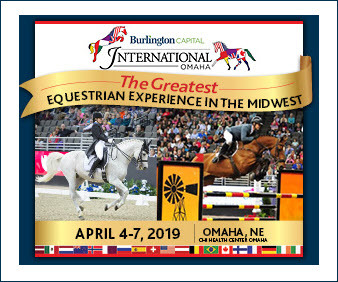 Pony Club requires members who’d like to compete on the team to have at least a D-3 certification and to commit to ride on the USPC team instead of their Zone team if they’re chosen. 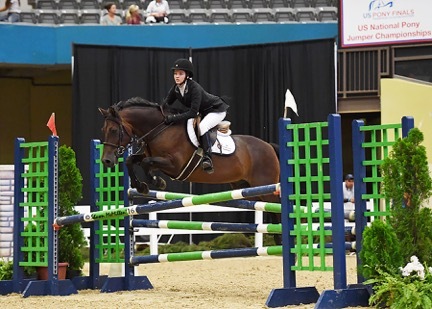 Keely, an avid show jumper, found the choice to ride for the Pony Club team an easy one. 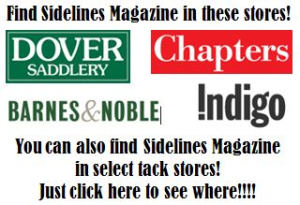 Sidelines caught up with Keely to learn more about her journey and her account of the competition. 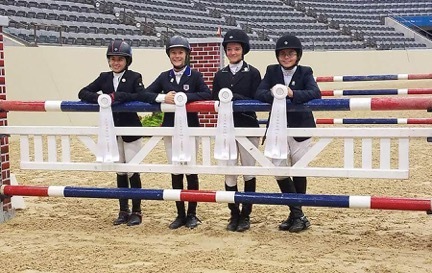 The United States Pony Club team shows off their success: from the left, Alexis DiPasqua, Genevieve Munson, Keely Bechtol and Megan De Michele. When did you join Pony Club, and what’s your ultimate goal? I was 5 years old when I joined. My ultimate goal in Pony Club is to become a certified “A” member (the highest certification available). What made you want be chosen for the Pony Jumper team? After watching the pony jumpers at Pony Finals, I quickly fell in love with it. I thought pony jumpers looked challenging, but very fun. I think the challenge is part of the reason I love it, as well as being able to compete at a high level with my pony. Being able to represent Pony Club is a definite bonus. Everything! I like the competition and being able to put everything I’ve learned into practice. I always learn something new at shows and I always have a great time. How do you feel Pony Club helped you prepare for Pony Jumper Finals? Pony Club has taught me a lot about caring for my horse, but it’s also prepared me to handle any situation that may come up, and how to work with a team. 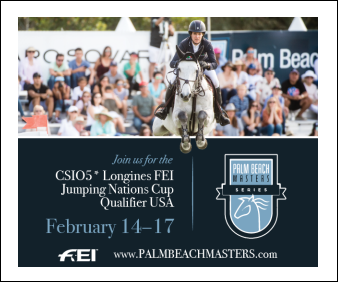 What do you feel was your biggest challenge in preparing for the Pony Jumper Finals? My biggest challenge was keeping my pony fit and ready to compete while making sure he was happy and healthy. While I wanted him to be fit and at the top of his game, I also wanted him to have fun and love what he was doing. 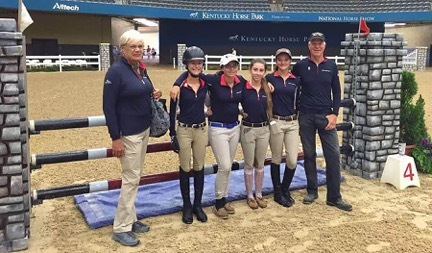 The United States Pony Club show jumping team, from the left, Coach Linda Allen, Genevieve Munson, Megan De Michele, Alexis DiPasqua, Keely Bechtol and Chef D’Equipe Richard Lamb. Can you describe the competition to someone who has never been? 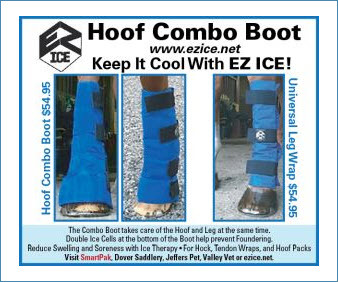 The Pony Jumper Championship is a national competition for the top nationally ranked pony/rider combinations. 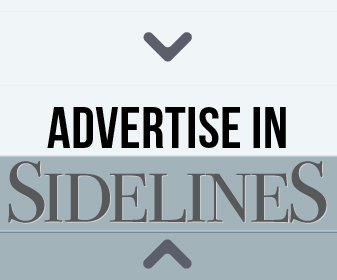 We compete both as teams and individuals throughout three days and over four courses. Now that Pony Jumper Championships is over, what was your best moment? Two moments that really stand out are feeling incredibly proud of my pony after completing the individual championship round, and after the team award ceremony. The Pony Club team tied for fourth and we had a great time celebrating with Zone 2. What was it like to be part of a championship team? The Pony Club team was amazing to be on. Everyone was super nice and helpful. The girls were great riders and our coach and chef d’equipe brought years of knowledge and experience to guide us. I’m so glad I got to become friends with people from all over the U.S.A.
Go for it! Pony Club is great and has taught me so much. It’s a great environment and has let me make friends all over the country.